Don’t Miss Our High Five Sale All Labor Day Weekend Long! It’s Labor Day this weekend! That means school is back in session, lower temps are (hopefully) on the horizon, and it’s time to settle in for autumn. Zach and Jody both celebrated birthdays this week, so we’re keeping the good times rolling by offering our very first MEGA SALE in WhichCraft history. We love giving high fives so we’re excited to introduce our High Five Sale. Basically for every $25 you spend you get $5 off. Simple as that. And there’s no limit to the amount off. A perfect celebration of the holiday weekend! Thanks for your continued support for our Beer Rescue Program. Here is an updated list of rescue beers. In other news, Jody drove up to Dallas to pick up some fantastic beer we can’t normally get here in Austin from Lakewood, Community and Martin House brewing companies. We’ll be sampling a few this weekend; read more below for details. In yet other news, did you know we’re currently part of the Austin Habitat House That Beer Built? We have these sweet glasses you can buy for $6 each and ALL of the profit goes to help build the home for the Huerta family. Support a great cause and get a cool glass! Oasis TX Brewing is one of the newest kids on the Austin scene and they’re kicking out sessionable styles that pair great with this time of year. We’ll be inviting in Hamilton from the brewery to sample out their London Homesick British Bitter, Slow Ride Pale Ale and Luchesa Lager. He may even have one special brew that isn’t in cans yet! Mission Brewing out of San Diego snuck up on the state with a very under-the-radar release. We’re happy to have 4 beers in stock, and they come in insane 32-oz cans. It’s like a mini growler! Virtue Cidery out of Michigan is a very highly rated craft cidery started by the old brewmaster for 20 years at Goose Island. He brings with him a hefty craft pedigree and his ciders are well balanced and made with excellent quality apples. They just launched in Texas and we have 3 varities in stock. One more random thing we’ll open up! Announcing Our First Texas Beer Run! Dallas/Fort Worth Edition. I’m happy to announce I just recently returned from my first Texas Beer Run up to Dallas and Fort Worth! That means that starting today you can buy your favorite beers from both Martin House and Community Brewing here at WhichCraft. Both breweries were happy to host us, gave us brewery tours, and provided us with samples of each of the beers we purchased… and a few we couldn’t! 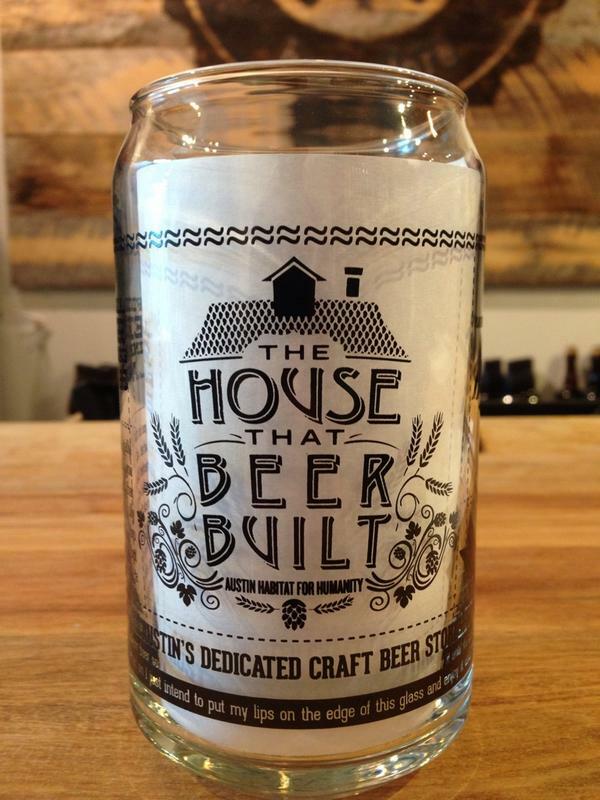 Buy any two 4-packs and receive a free Martin House-branded beer can glass! Witbier – This is the brewery’s homage to Pierre Celis, original founder and brewer of Hoegaarden as well as Celis Brewery right here in Austin. This is an incredibly well developed example of the style, and believe me when I say this is one of the best witbiers I’ve ever tasted, hands down. That gold medal ain’t no joke! 5.1% ABV. Mosaic IPA – This is not a single varietal IPA, but Mosaic hops definitely take center stage and provide a huge citrus & floral burst, both on the nose and the taste. British Maris Otter and American Pale malts stand up to the bitterness so it ends up being a very drinkable IPA at 7.5% ABV. Vienna Lager – I personally rarely reach for a Vienna Lager as a general style, but this one is quite tasty and could make me rethink that decision. It’s just malty enough and offers enough of a crisp lager & hop finish to make it really quite drinkable and more complex than you’d typically find in a Vienna lager. 5.2% ABV. Texas Pils – This is a German-style pils that offers everything you want it to from the style and a few extra little treats. They use over 90% Hanka variety Pilsner malt from Bohemia: an heirloom barley variety related to the oldest cultivated barleys in Eastern Europe. This barley has a rich, smooth taste that stands up to the noticeable hop character of this beer. In order to stand up to the added malt characteristics, this pils clocks in a 6.1% ABV and uses a new German hop – Hallertau Blanc. Public Ale ESB – This is Community’s other gold medal winner, and it is a great example of the style. They use 100% British malts to perfectly nail the style’s typical bready/malty characteristics. ESBs never offer much of a hop bite, and this one balances all that bready malt with just enough hop to really blend in well. 5.5% ABV. Trinity Tripel (750mL) is a hoppy Belgian-style Tripel, technically falling into the Belgian-Style Pale Strong Ale category. The smooth body and flavor come from select German Pils malts used for the grist, lending a deep golden hue and clean finish. The lack of complexity in the grist is necessary to highlight the stars of the show: three of Community’s most beloved Belgian yeast strains and a new German hop variety called Mandarina Bavaria and also the famed Nelson Sauvin hops from New Zealand. 9% ABV. As time progresses, I plan on making more of these Texas beer runs, with the goal being able to offer our customers access to beers they’ve heard or read about from Texas but haven’t necessarily seen on Austin shelves. This is all part of our ongoing mission to truly be a destination store for craft beer lovers. Cheers!